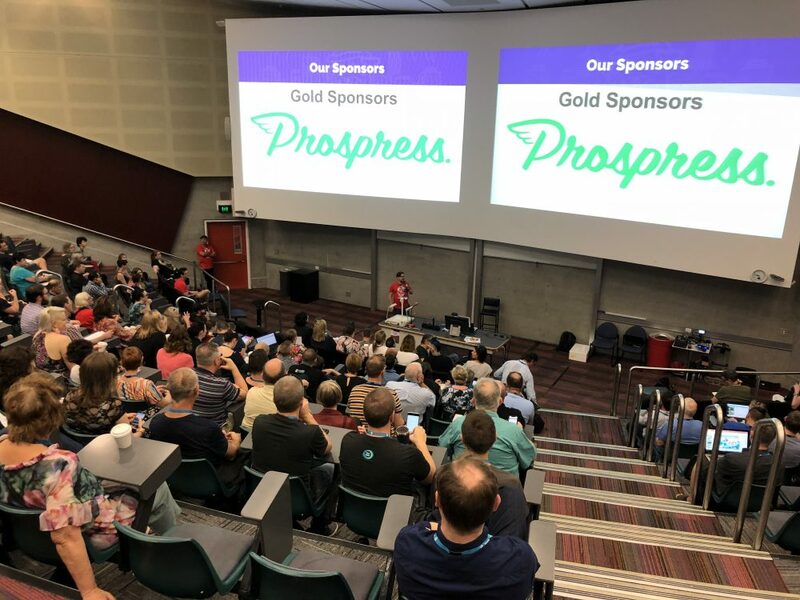 This year at WordCamp Brisbane Prospress was a Gold Sponsor. Gold – the colour of champions! Therefore we proudly sent our full contingent of Australians to represent us at our magnificent sponsor booth. Here our team took great delight in dispensing both bonhomie and huge amounts of swag. We always love an opportunity to engage with the WordPress community- and talk about our products! I had a chat with Dan, of AutomateWoo fame, about his experience at WordCamp Brisbane. Carolyn: Why did you want to attend WordCamp Brisbane? Have you been before? Dan: I had actually only been to two WordCamps prior to WordCamp Brisbane. My favourite part of attending those was definitely the community experience. I love connecting with other people working with WordPress and it’s always great to be reminded that we’re building software that real people rely on. So that’s a big reason I wanted to attend. 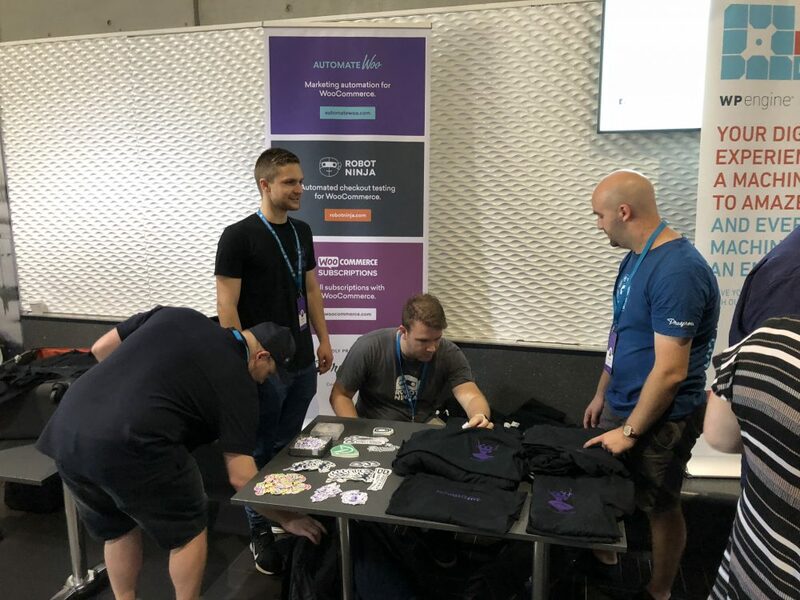 I was also looking forward to having a Prospress booth and handing out our freshly printed AutomateWoo t-shirts! Carolyn: What were your initial impressions when you arrived? Dan: I remember thinking the venue was nice, there was a big central open space with couches and the booths were set up to the side. Also the location was nice. We had to walk through the Brisbane botanic gardens to get there. Carolyn: Is there anything that made this WordCamp uniquely Australian? Dan: There were some cool Australian themed WordPress stickers featuring koalas and cork hats! Carolyn: Tell me about the Prospress booth? How much swag was there!? Dan: I really enjoyed having a Prospress booth! I actually spent more time at our booth than in the sessions. We gave away a ton of swag. We had stickers and brand new AutomateWoo t-shirts, both of which were popular with attendees. It seemed like there were always people at our booth, which was awesome. We had some great conversations with both existing customers and people who hadn’t heard of our products. At one point I even did a spontaneous demo of AutomateWoo to a small crowd. Carolyn: What did it mean for Prospress to be Gold Sponsors? Dan: I think being gold sponsors was a great way to give back to and grow the WordPress community, which Prospress and me personally have benefitted so much from. It’s was also a great way to promote the Prospress brand and our products. Carolyn: What was your favourite talk/ session and why? 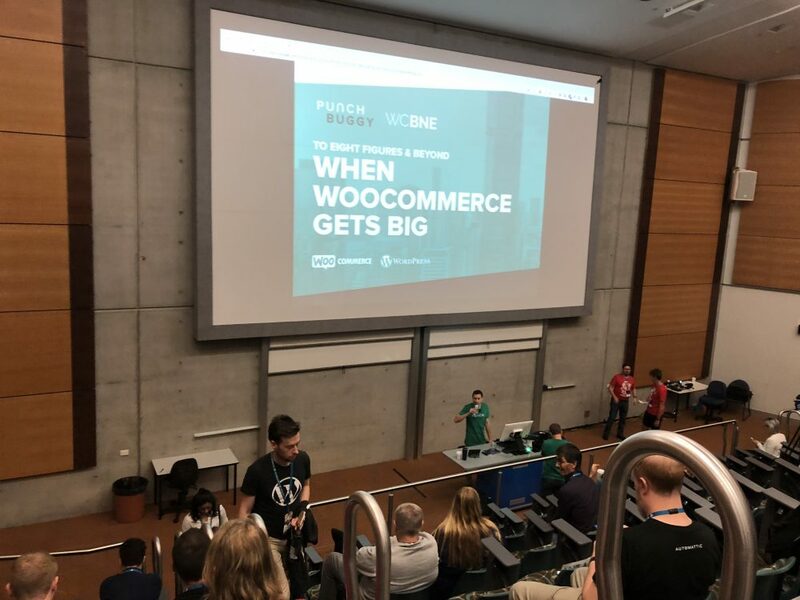 Dan: My favourite session was ‘To Eight Zeroes and Beyond: When WooCommerce Gets BIG’ by Ben Rollins and Ryan Fitton from Punch Buggy. I met Ben and Ryan before their session when they came to the Prospress booth and we talked about how they are using our plugin WooCommerce Subscriptions at a large scale. I enjoyed their session because scaling WooCommerce can be challenging and it’s something I’ve personally been working on with AutomateWoo. So it was great to hear about the challenges they had faced and about how they had solved them. Carolyn: Did you meet a lot of people at the WordCamp? Dan: Absolutely! I think the WordCamp had a relaxed vibe and people were friendly and willing to chat. Meeting people was definitely a highlight of the WordCamp. Carolyn: What was the afterparty like? Dan: It was cool! The turn out was really good and there were great beers on tap. I randomly met a German speaker so I enjoyed the opportunity to speak a language which I hadn’t used in a good six months. A group of us went for dinner before heading to the afterparty which was also great. Carolyn: What was your key takeaway from WordCamp Brisbane/ overall impression of this WordCamp? Dan: Overall WordCamp Brisbane was a great experience and I’m already looking forward to the next one! It was well organised with diverse and quality sessions. I was surprised to see how big the WordPress community in Brisbane has become. Carolyn: There was a group of people from Prospress who went – was it fun to hang out IRL? Dan: All of the Prospress crew currently living in Australia attended the WordCamp. Hanging out IRL was a blast! We didn’t stay in the same place because 3 out of the 5 of us actually live in Brisbane but we spent the majority of the weekend together. We also worked together IRL in the Prospress Brisbane office. Being a distributed company, the rare times that we get to work in the same room are always great. During the meetup we decided do a big push forward on integrating WooCommerce Subscriptions with the AutomateWoo website and we had some great discussions about the future of Robot Ninja and AutomateWoo. We had a few fun team hang-outs in the evenings like bowling and tapas! 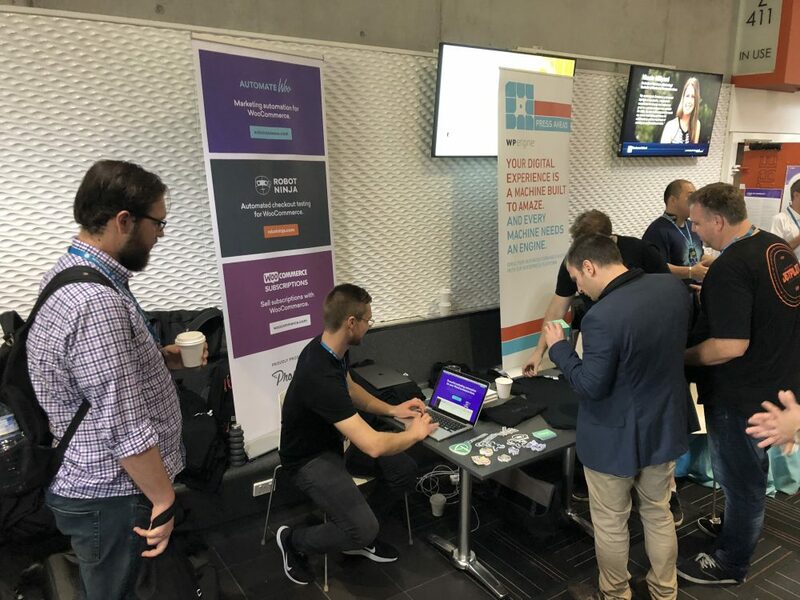 As Gold Sponsors Prospress had a wonderful opportunity to interact with the Brisbane WordCamp community. Brisbane is particularly special to us, being the home of our director Brent – and the location of something almost as rare in a remote company as an ice skating Bigfoot – a co-working space where multiple Prospeeps work together (well three)! It was also marvellous to get all the Aussies together IRL- to briefly increase the number of co-workers in Brisbane to 5 – and to have some fun together. We have a whole plethora of people attending WordCamp US in Nashville next month- so look out for us there! We are also hiring, so if you are lucky enough to be at a WordCamp we are attending feel free to come up and talk to us about working at Prospress. 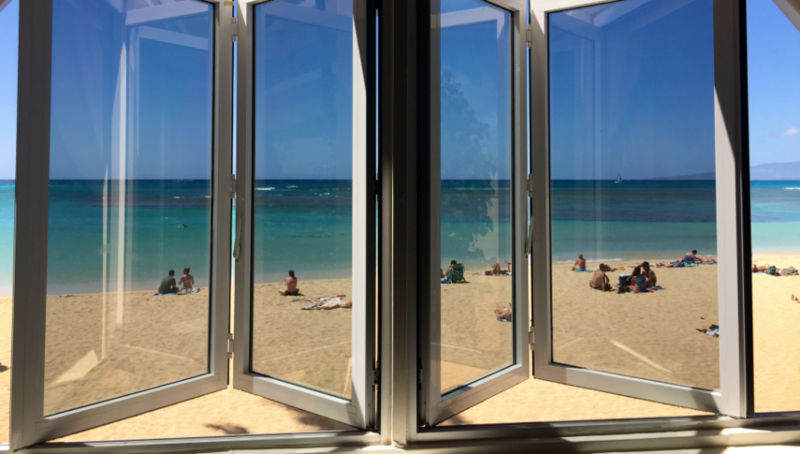 Many thanks to Dan Bitzer from our Ventures team for his contribution to this post!